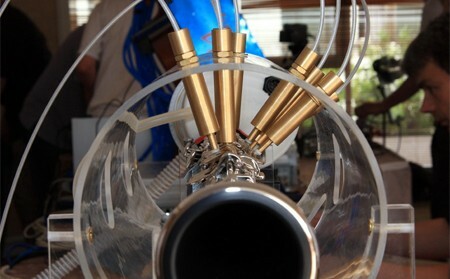 Australian research group NICTA in association with the University of New South Wales won the 2008 Artemis Orchestra Competition with their robot clarinet player. The competition challenges participants to design embedded systems that can play unmodified instruments. NICTA took first prize with their roboclarinet, due mainly to the complexity of the robot’s “mouth.” It uses two servo motors to act as a surrogate tongue and lips, vibrating the reed of the clarinet in a way consistent with human playing. The keys of the clarinet are pushed by a series of brass plungers. All of the robot’s functions are controlled by a computer running Linux. If great sound or novel technology are not enough for you, then the project is at least worth a look for the robot’s attractive, slightly steampunk-esque look. Watch it in action after the break.